Designed to detect major leaks and help prevent flood damage caused by leaking pipes and fittings or by vandalism. 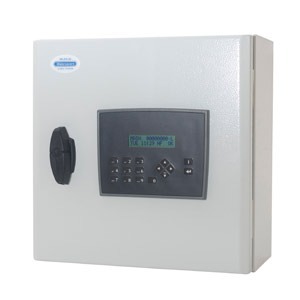 The WLDS-10 Mk3 panel is connected to a pulse water meter installed at the site boundary or main intake point of the building and hence monitors the consumption of water. An alarm output is activated when a continuous flow of water passes through the water meter at a flow rate above a preset maximum for a preset period of time. A normally open free contact is provided for connection to a BMS (Building Management System) or to activate a local beacon/sounder type alarm. Available as an optional extra product code SB-100. A programmable free contact is also provided to shut off the water supply via Normally Open or Normally Closed solenoid shut off valve if required. The WDLS-20 Mk3 has pulse water meters installed at the site boundary and at the main intake and in addition can detect a loss of water between the site boundary and the main intake point.